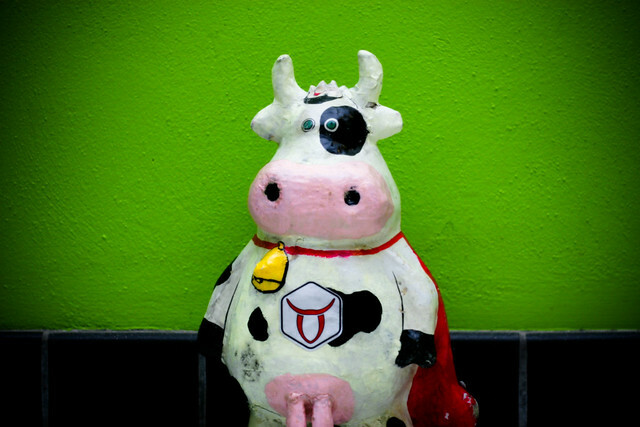 I like engineers but this is ridiculous (and I’m not talking about Supercow, the U of C engineering mascot). The PC government just invested $142.5 million to expand the Schulich School of Engineering at the University of Calgary while at the same time hacking $147 million out of the province’s post-secondary budget. Yes, I know, the $142 million is a capital (one-time) payment while the $147 million decrease in the post-secondary budget is an operating budget (on-going) cut, so it’s impossible to have an apples-to-apples conversation about this. Instead of focusing on the dollars, let’s focus on how the PC government is using Campus Alberta to maul the University of Alberta and mollify the University of Calgary, and why. Both universities suffered as a result of the 2013 budget cuts, but only one, the U of A, is face down in the dust. The U of C will emerge even stronger. The Department of Enterprise and Advanced Education describes Campus Alberta as a concept to formalize and encourage further collaboration between the province’s 26 publicly funded post-secondary institutions. Oh, it’s a fuzzy collaborative thingy. Ah…no, it’s a meat cleaver used to cut post-secondary institutions down to size when the bitumen bubble burst and there wasn’t enough royalty revenue lying around to cover the government’s costs. For some unknown reason the U of A was under the misapprehension that academic independence meant it was free from state interference in its internal affairs. I’ll admit I was under the same misapprehension. When the government announced draconian cuts to the post-secondary education budget, the U of A fought back. Faculty, students and the public expressed their dissatisfaction by publicizing the impact of the cuts, talking to their MLAs, raising the issue with the University’s President and Board of Governors and staging protests outside the Legislature. The minister was not amused. * He stripped the U of A of its financial independence by rejecting its three-year deficit budget and approving a one-year deficit budget on the condition that the University file quarterly financial updates. Mr Lucaszuk also assigned a “consultant” to work with the University to sort out its long-term fiscal sustainability problem. Not satisfied to stop there, the minister stripped the University of its right to its reputation. He castigated the U of A for daring to describe itself as a “leading research-intensive post-secondary institution” and a “flagship institution”. The U of A was nothing more than one of “26 important institutions, all of which have a critical role to play in a diverse and differentiated system.” Don’t you go thinkin’ you’re any better than Keyano or Norquest, y’hear? Meanwhile life at the University of Calgary is peachy. Notwithstanding the budget cuts, the U of C discovered a stash of cash in its operating budget—enough to hire 30 assistant professors, postdoctoral students and research chairs. These academics will form a “confederation of scholars” who’ll collaborate with industry on conventional and unconventional energy research. The “confederation” will join more than 200 faculty members already conducting energy research and training graduate students and postdoctoral fellows. Apparently the collaborative approach is highly successful. Over the last five years researchers have spun-out companies and issued more than 50 oilsands recovery patents—all on the Alberta taxpayers’ dime. The government anted up $142.5 million of the $158.3 tab. The remaining $15.8 million is coming from the private sector. The expanded space will be ready for 400 students in 2016. Still no word on where the operating funds will come from but U of C President Elizabeth Cannon is not worried—talks are ongoing. Not only is Mr Lucaszuk blithely unconcerned about the U of C’s operational shortfall, he stands proudly in the wings while the U of C video embedded in the government’s press release gushes with grandiose statements like “The Schulich School of Engineering is a top ranked school” and “The University of Calgary will be a global intellectual hub”. The only thing missing is “flagship institution”. The PC government has put all of its educational eggs in one basket. Post-secondary institutions are simply another “service provider” (to use supply chain terminology) that must deliver a return on research investment. The U of C gets this and is well down the path to becoming a technical school that provides training at the post-secondary and graduate school level. The U of A on the other hand is holding itself to a higher standard and is suffering as a result. Campus Alberta, the meat cleaver, has come down hard on the U of A and will do so again until the U of A becomes part of the value chain…or the PC government is replaced by a party that values education for its own sake. Oh, before I forget, Mr Schulich donates money to many post-secondary institutions across Canada. Upon receiving the donations all of these institutions change their names to become the Schulich School of [fill in the blank]. The biggest donation so far went to the York faculty of business. It’s now known as the Schulich School of Business and all degrees issued by the school bear Mr Schulich’s signature. We’ll know that the fight for academic freedom is well and truly lost when the degrees issued by Alberta universities bear the signatures of successful businessmen. This entry was posted in Education, Politics and Government, Uncategorized and tagged Campus Alberta, Lukaszuk, Schulich School of Engineering, University of Alberta, University of Calgary. Bookmark the permalink. Have the conservatives already forgotten what the UofA has done for Alberta’s only industry; helping them to get the hydrocarbons out of all that bitumen? Or what about all the research into horizontal drilling tech they’ve contributed? GoinFawr, the government has not only forgotten what the UofA has done for Alberta’s only industry, by focusing on nothing but the oilsands it’s foreclosed the UofA from doing research into other areas that could move Alberta’s industries into the future. Contrast this to Norway’s model for “supporting” the oil industry’s R&D. Norway conducts most of its R&D through its state owned oil major Statoil and through tax subsidies to small companies engaged in R&D. This model has proven extremely effective in part because Norway has the highest oil tax in the world (78%) but companies get a tax credit on R&D, a 78% rebate on exploration costs and can write of a lot of their investment costs. The end result, according to a representative of Norway’s equivalent to CAPP, is that with such a high marginal tax rate the companies are pushed to invest and do research. This means that research for the oil industry is being done by industry, not by Norway’s universities. Makes sense to me. I think this reflects well the atittude of this government in general. Furthermore for those of us from Edmonton, we are used to this kind of preferential treatment. Calgary always wins despite the fact that it is a city with way more resources than the capital. This is not new. Edmonton is happy when there is no interference but even that is difficult. Considering the minister we have, this is just another failed process to add to the existing ones. It is hard to believe that we have to endure another couple of years of this absurd march into oblivion. Carlos, your comment about Edmonton being treated like a second class citizen rings true. Makes me wonder whether the fact that Edmonton has 4 NDP MLAs has anything to do with it–vote PC or get the back of the hand. The Whiter the UofA blog has a very interesting commentary on how this exercise may be part of a power play between Thomas Lukaszuk and Alison Redford with Redford trying to throw her deputy premier under the bus by making him the bearer of bad news, but Lukaszuk somehow coming out ahead. It’s worth a read. The author of the blog, sums up the outcome with this: U of C will remain U of C, but U of A will henceforth be referred to as Campus Alberta—Edmonton branch. After all, most people from out of province already assume the University of Alberta must be in Calgary. Truly a sad day for higher education in Alberta. Susan my comment about Edmonton is absolutely true and has been for a long time. Edmonton has survived with its creativity and ingenuity and many very dedicated citizens but it is sad that in 2013 we still have to witness this kind of mentality which is so destructive. Two very succesfull cities is what we all desire and that is what builds a better future. You got it very right about the NDP MLAs and the consequences of that choice to Edmonton. Again that has been a battle for decades. The Edmonton Sun never stops with the brain washing using the word REDmonton whenever it is possible. Edmonton has done very well and does not do better because we are not allowed to. I totally agree with the blogger and I would not be at all surprised that what he suggests comes to reality. We all know Calgary is where the big money is and unfortunately big money not always attracts big brains. It is a very sad day but not a surprising day. To me a retarded policy just like many before. Carlos, I attended the Brian Mason vs Danielle Smith Debate at Mount Royal University on Thursday and got a taste of what the next election might look like. Both Smith and Mason were very respectful of each other (I think they like each other more than either of them likes Redford). In a nutshell the “divisive” issue will be how to provide public services like education, healthcare, senior’s care, etc and more importantly who’s going to pay for it. More on this on Sunday’s Soapbox. Stay tuned! This is so awful, and shame on the government for doing this. How are universities supposed to keep operating with budget cuts like this? Ashley, you’ve summed this up perfectly…thank you!